The perfect kind of reading when there is nothing to read is a good Agatha Christie. It just shakes you up and your day is then made. It does not even take too much time to get through one. And of course when it is a mystery that involves the adorable Belgian, Poirot, then you know you cannot go wrong. You will love the book. I decided to go through the entire Poirot collection and hopefully finish it by the end of this year. So, I started where it all began – “The Mysterious Affair at Styles”. Poirot’s first case and the grand dame of crime does it like no other. The setting is World War I and in England (but obviously, to begin with at least). The Styles mansion residents wake up to find Emily Inglethorpe poisoned and long gone. Captain Hastings is at the scene and this is where his dear friend Poirot enters the scene and everyone is under suspicion. The family, The servants, The neighbors and the well-wishers. Almost everyone. The writing but of course builds up only towards the middle of the book. The rest of the time it is all about creating the much needed atmosphere of the book. 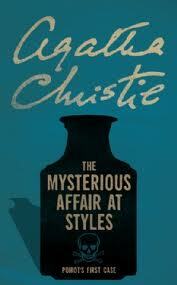 The characters are almost synchronized by Christie brilliantly and Poirot – the one who holds all the threads and cards. It is funny how out of all the Poirots, I had not read this one. At some point, I thought it was too long for a mystery, but then again, I just had to get that thought of my mind and dive into the book once again. “The Mysterious Affair at Styles” is vintage Christie – it has all the elements of crime – a good setting, characters, and a great detective that is just been introduced. For those who have not read it, I strongly recommend this one . Enjoy. This entry was posted in Agatha Christie, Authors, Authors I Love, Books, Harper Collins, Harper Collins India, Mystery, Review and tagged Agatha Christie, Belgian, crime, detective, england, harper collins, Poirot, Poison, The Mysterious Affair at Styles, WW1 on March 16, 2014 by thehungryreader.